Welcome to the 2012 Ultimate Blog Party at Brimful Curiosities! Please grab a wood stump chair, put up your feet, make yourself at home and stay awhile. We like to keep things whimsical and relaxed here. My name is Janelle -- I'm the hostess and blog proprietor here at Brimful Curiosities. I'm a stay-at-home mom to two young children. And, in case you didn't guess by the subtitle, I like to read children's books with my kids and blog about our reading experiences. We also spend time crafting, exploring the outdoors and doing all the normal things families do together like building Christmas trees out of books and making silly things out of Popsicle sticks. One of the regular features here is my Full to the Brim - Kid's Book Giveaway List, published each Friday (though this year I've been somewhat lax at publishing each week, but I hope to get back into the groove soon). If you like children's books and entering giveaways, you'll probably want to take a look at my lists. Additionally, my kids and I often post a fun, book-related craft each week, and I try post a photo for Wordless Wednesday each week. Other than that, my posts vary ranging from reviews to personal observations. be sure to lake a took! it doesn't batter a mit. we always bind fooks that are a hit. just what I'll decide to post. it's best not to bit and soast. So friends, don't hesitate to stop, hay si! I cruly therish each and every comment left here. it's cun to fonnect at the UBP every year! This is my fourth year participating in the party, and I've been blogging since 2008. If you want to know more about me you can read my previous party posts 2011 and 2010 and 2009. Thanks for stopping by my blog for the UBP. :) Loved your very pilly soem (did I do that right?). lol Hope you're having a great weekend! stopping by from the UBP! I am also a SAHM to 2 boys) Lots of fun - even though they keep me running most of the day! Would love to have you visit over at http://www.talesofmommyhood.com/2012/04/ubp-12.html - and enjoy the rest of the party! stopping by from UBP2012!!! love your poem how cute!!! stop by if you get a chance and say hello..
Fun party post!! Thanks for visiting today. Thanks so much for stopping by our party at Thanks, Mail Carrier, Janelle! 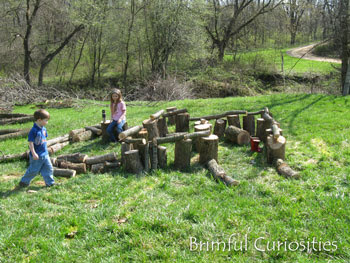 I love the stump chairs and the cute poem about your blog - so creative! Runny Babbit is a hoot, but so challenging to read aloud! Funny how our minds just automatically "read" words they way we know they are supposed to be, and switching things up leaves us tongue-tied. My fourth and fifth graders used to fight over that book. I'm impressed with your own poetry skills. Kudos to you! We LOVE shel over here!! Thanks for visiting me. I hope you made a lot of new "friends". This year there didnt seem to be quite as many participants participating as in previous years. What do you think?